Advance Sweeping, LLC provides street, pavement and sidewalk cleaning services throughout the Central New Jersey area. We welcome Property Contracts, municipal bids, construction and event contracts – short and long-term. We accept both Union and Non-Union Jobs. 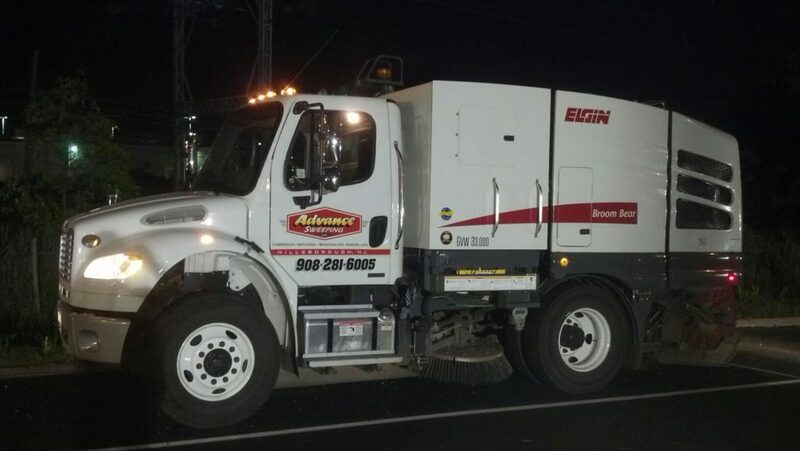 Established 1980, based in Hillsborough, Advance Sweeping, LLC provides service to Somerset County, Hunterdon County and the Hillsborough and Flemington Areas. Advance Sweeping, LLC is owned by Frank Krachun and owner/operator Ben McCrone, Jr., who has been involved in landscape design & maintenance, sidewalk pavers & lighting installation, & general property management since 1980. Using our state-of-the-art equipment, thorough knowledge of the industry and superior skills, we get the job done right. At Advance Sweeping, LLC we know all there is to know about state and federal regulatory compliance and are constantly updating our knowledge through research and education. We are proud members of the North American Power Sweeping Association (NAPSA), and are available for both Union and Non-Union jobs. We understand that building and maintaining residential and commercial property today has become more expensive, and customers have more choices than ever before. At Advance Sweeping, LLC we have learned the importance of treating each job with the utmost attention to detail, and completing them on time, on budget, and that getting it right the first time is critical to our customers in today’s economy. Contact Advance Sweeping, LLC today to find out how we can help you keep your streets and parking lots clean, safe, and inviting. You can rely on us to complete the job on time, within budget, and to your utmost satisfaction. Materials such as sand, salt, leaves, broken glass, small pieces of metal, and other litter and debris must be removed from streets, parking lots and sidewalks in order to prevent these materials from being washed into storm sewers and surface waters, and to improve the appearance and safety of public roadways. Street sweepings require special handling to meet environmental protection laws. Street sweepings usually contain low levels of chemical compounds associated with storm water runoff, as well as metal compounds from road sediment. Road accidents, salt, sand and water residue also increase hazardous elements in street sweeping debris. It is essential hazardous waste removal and disposal procedures are used when performing street cleaning services. Street sweeping and pavement cleaning services must be performed at proper intervals to ensure maximum compliance, safety and protection of road surfaces; and may vary by season. A professional, trained and experienced with these laws, such as Advance Sweeping, LLC, will develop a schedule that meets this criteria. Well-maintained roads and pavement provides comfort, convenience and safety to clients, visitors, and citizens. Making sure your pathways, driveways and roads are properly cared-for lowers incidence and risk. Storage and disposal of debris must be handled expertly, and according to local ordinance. Advance Sweeping, LLC is knowledgeable and experienced in the removal and handling of pavement debris. Construction site clean-up requires additional adherence to regulation. We are prepared to perform these services in accordance with the law, and to your satisfaction. Contact us today to discuss your specific needs and goals. We will assist you in planning a sweeping maintenance schedule that puts your budget to work and eliminates potential problems.